The neural collage ‘When Schwitters met Trump’ responds to the angst of our time just as its historical and political references play with each other across ideological and temporal eternities of striated histories. An image of current American President Donald Trump signing one of a number of mysterious but publicly ostentatious executive orders was sampled from the information stream of the world wide web and computationally blended with the compositional sensibility of Kurt Schwitters’ revolutionary Das Und-bild using neural network ‘style-transfer’ as a starting point, proposing that in the mash-up of artificial and questionable intelligence ‘everything has broken down and new things have to be made out of the fragments’ (Kurt Schwitters). 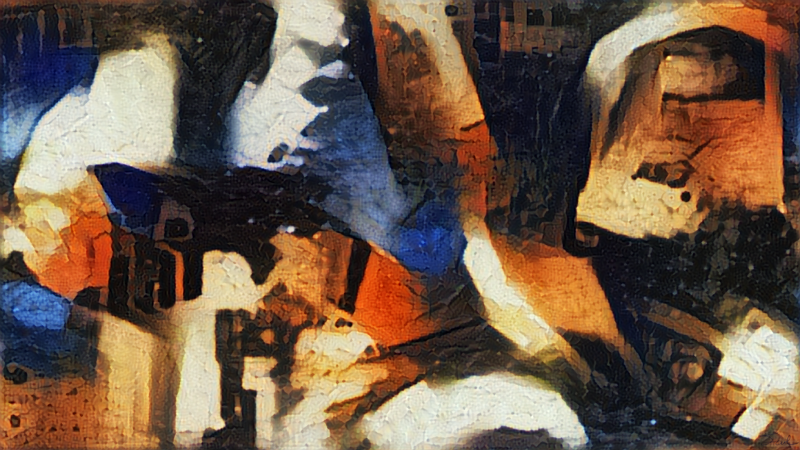 Growing out of my work in interactive abstract narrative, ‘When Schwitters met Trump’ reflects my concern with the divisionism that arises out of the juxtaposition of subjective truths and fake news; a world of liminal existence, uncertainty, and irresolution, which is nonetheless encoded and controlled.